The silk shirt is the epitome of effortless chic, and no woman’s wardrobe is complete without this timeless staple. It’s completely versatile, seriously classic, and never outdated, there really is no other wardrobe staple quite like the it. The best part of this foundation piece is it can be anything you want it to be silk shirt to be, casual, effortless, stylish, smart, tailored or masculine. It’s the chameleon in your wardrobe and will help you play whatever role you want it to play. 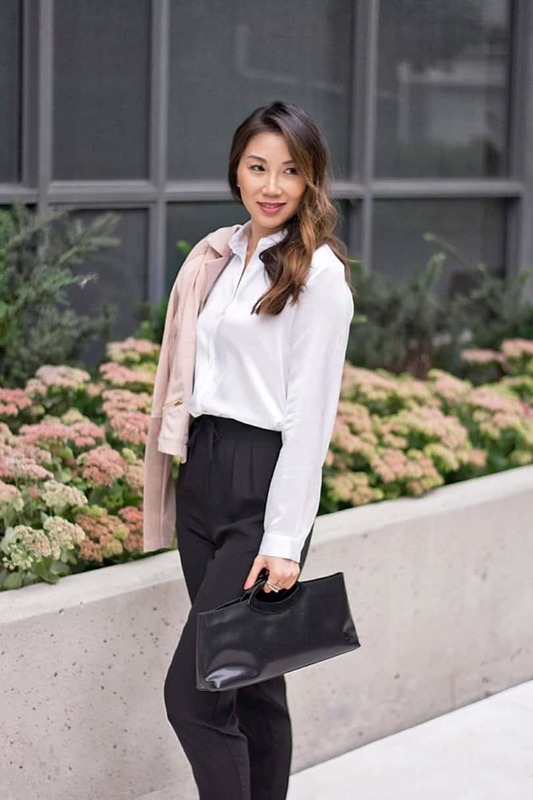 Pair it with with tailored smart trousers (like I have here) for a professional look, simple skinny jeans to go casual, or tuck it into high-waisted skirts for immediate fashion editor-appeal. I’ve teamed up with LilySilk to run a giveaway for a free silk shirt, just like the one I’m wearing! If you are a silk lover like myself, you should check out LilySilk for their luxurious silk items, they carry everything from bedding and sleepwear to fashion collections for women and men. When I received my first order from LilySilk I was amazed about the quality of the silk. The silk felt strong, yet soft and smooth, and felt like a dream to wear. They use a 100% Mulberry silk that is known for its luxury, comfort and health benefits, is completely chemical-free and sensitive skin-friendly. Both my pants and my shirt from this outfit are from LilySilk and so pleased at the quality of the products. Both were well cut and tailored and look flattering to wear. The silk shirt has is a classic fit, with the buttons concealed to give a polished look. It has a beautiful sheen to it and the material feels thick and soft, and not see through at all. The pants are pleated drawstring trousers and are so comfortable to wear. They’re both anti wrinkle so they hold their shape well and are also breathable which is perfect for those hot summer days. Right now they have this silk shirt on sale until September 5th, 2017 for only $69.99 (originally $159). This classic silk shirt goes effortlessly with any ensemble whether dressed down with denim or up with trousers or a skirt. Right now you can also get an additional 10% off with code “GIVEYMS”. Ready to win a silk shirt like this for yourself? for this LilySilk Shirt Giveaway! 1) Comment on LilySilk Basic Silk Shirt product page… and thats it! For bonus entries complete some easy tasks like following me in Instagram, Facebook and Twitter, make sure you check it off in Rafflecopter below! "Style Essentials to Get You Ready For Fall"
"Getting Your Home Ready For Fall"
Link does not go to shirt. I much prefer the romantic chelsea collar silk blouse. I had never heard of that collar before but I will be looking for it now. This is so chic and professional! I love silk! It is so comfortable and lightweight. This is so versatile and would be great paired with so many things. The shirt looks pretty. Silk always gives you that flair, that elegance that no other fabric can provide. I also like the cut ot shirt. The concealed buttons is always a nice thing. Staples stay in style forever. This silk shirt is a timeless piece. So flattering and so easily to style so many ways. I love silk, whether it is a shirt or beddings or pajamas. It just feels so luxurious! I like the shirt you wore in this post. Its style is a classic and can be worn casual or formal. I just love the way silk drapes – it’s so luxurious and stylish. This one looks great on you, too … you can go straight from the office to your cocktails date! You look so classy. I love that silk shirt of yours. Awesome. This outfit is perfect! You have style and charme! Classy and elegant! I don’t have much silk blouses but I think I need a white one like that. I love the hidden button style too. It’s beautiful how you styled this outfit. It’s a nice work outfit especially since it looks so comfy and you’re able to move as you please. This looks so nice on you. I think this beautiful shirt would look great with anything! I love how versatile this blouse is. I love how the material feels and versatile this blouse is. Great to have in the closet. I would wear this with high waisted pants and a trench coat! Such a classy blouse. I just love it in white. I love the Blouse. It’s so versatile and comes in great colors. Silk blouse looks clean, elegant, and full of energy.